What a lovely evening outdoors in the Courtyard as the sun began to set. The next one is on August 25th featuring The Dream Team Blues Ensemble with Jesse Waldman on guitar and vocals and Monte on harmonica! True blues. Urban Folk – Live at The Firehall Arts Centre 280 East Cordova Street, Vancouver, BC. "If you can get them once, man, get them standing up when they should be sitting down, sweaty when they should be decorous... I think you sort of switch on their brain, man, so that makes them say: 'Wait a minute, maybe I can do anything.'" - Janis Joplin. 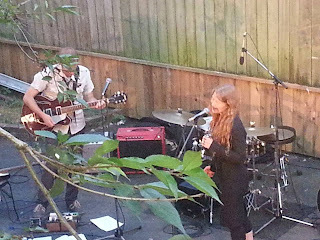 Roll over "Queen of Psychedelic Soul and Rock and Roll" a new queen of Urban Folk is fast emerging in British Columbia. 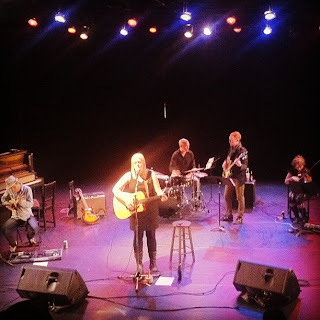 With a standing ovation on her CD release night Beth Southwell’s path to fame has begun. A tenacious performer, singer and songwriter, she has tread the road of initiation, self-discovery and generosity, which are reflected in her soulful lyrics and musical reveries. Blessed with an affable spirit Southwell’s embracing persona warmed the audience, inviting us to walk alongside the minstrel in her personal journey and appreciation of life and the Canadian landscape. With only a short walk through the edgy central artery of East Vancouver’s most poverty stricken quarter and easy to access via public transit, The Firehall Arts Centre was a fitting venue for this rising star as it is an oasis for individual talent and creative community activities - serving as a touchstone to illustrate and bring to light the cultural diversity of Canadian performers, producers and playwrights. Beth Southwell’s self-titled CD Release concert featured guitarist Jesse Waldman, bassist Michael Rush, viola and piano Monica Lee, drummer Michael Simpsonelli, violin and saw Meghan Engel and back-up singers Christie Rose and Bahiyyih Peters. Tall in stature and stage presence, Southwell’s blonde head, black dress and boots, stood bold and confident in her delivery. Self-effacing she was generous in highlighting the talents of her friends and band members, with each contributing a solo performance adding diversity of talent to the concert, including something I had never witnessed before, Meghan Engel on saw. Yes, I’m sure I’m not alone as an ignoramus in believing the common old garden saw was designed to cut wood, but from henceforth my appreciation of the saw as a magical instrument of music, played with a bow, has been forever corrected. Engel played seated with the handle clasped between her long slender legs, while holding the far end with one hand. The sound emitted was sweet and eerie at the same time adding texture to Southwell’s melodies, harmonies and profound lyrics. As an immigrant, having a deep appreciation for the majestic beauty of the Canadian landscape, a moving highlight of the performance for me, was the tribute song to Lake Ontario, where Southwell on acoustic guitar, sings of “the cool clear water that cleanses my soul,” adding a soft flowing spirituality to the musical timbre she is accompanied on viola by Monica Lee and Meghan Engel on violin. An animated youthful persona Jesse Waldman entertained the audience with his wisecracks and high energy antics, seamlessly connecting the musical flow while maintaining ambience in texture through his multi-talented skills as vocalist and musician on acoustic/electric guitar and piano. Waldman is a high profile performer in the lower mainland with his bands Electric Kids, Supna, Phatty Phatty and the Roaches, including performances at the Libra Room as a member of the Monica Lee Band. Another rising youthful talent on the Vancouver music scene is singer and songwriter Christie Rose who sings backup for Southwell. A powder keg of musical ability Rose was able to shine as she belted out a country song duet with Waldman on piano. Rose possesses a deep confident voice which belies her petite physical beauty.A truly Canadian family Urban Folk event, Beth Southwell’s CD Release concert was and is the forerunner to many more live performances by this world traveller, who has toured the UK, Taiwan, and the West Coast, I believe Southwell will continue to rise in status due to her genuine regard for nurturing Canadian soul and storytelling through her music. So be sure to keep tabs on this evolving star and her friends, who have come to realize – “Wait a minute, maybe I can do anything." CD Release Concert follow up! I had an amazing time at the CD Release concert that took place at the Firehall Arts Centre on June 22nd. From the moment we walked onto the stage, more love than I could ever have imagined came rushing over me from the audience. I was so fortunate to be surrounded by some of my dearest friends on stage making my songs become larger than life. It was a night I will never forget including the longest standing ovation I have ever experienced. Thank you so much to everyone that supported me and the release of my first full length album. My songs are now available as downloads. You can buy the individual songs or the whole album. Another exciting new chapter in the world of releasing an album.